Turn on the car radio after a glorious day on the beach at St-Hilaire-de-Riez. What is on France Musique? Offenbach's Gaitée Parisienne or Bizet's L'Arlesienne? No, it's the closing pages of The Dream of Gerontius and just a few bars tells me that it is Glorious John Barbirolli's radiant recording with his beloved Hallé and Janet Baker. The music hits me like a punch in the solar plexus and I have to pull the car over. Thank you for great music and for the serendipity of good radio. As Pope Pius XII said, 'My son, that is a sublime masterpiece'. 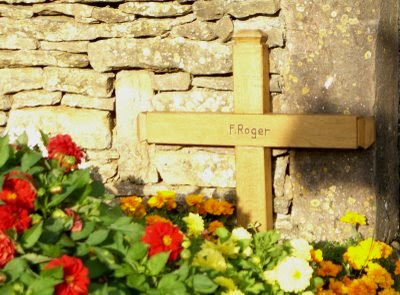 + In memory of Brother Roger, founder of the Taizé Community, who was stabbed to death on 16 August, 2005 while at evening prayer in the Church of Reconciliation. Cardinal Kasper said of Brother Roger "Every form of injustice or neglect made him very sad". Visit the green hill called Taizé here and its music here. Richard Strauss more than once said to Sir Adrian Boult about Gerontius : "But this is a masterpiece!". I'm sure he wised he'd composed it!